Opening in 1929, fans flock from all over Iowa to Kinnick Stadium to see the Hawkeyes each Fall. Football became a varsity sport at Iowa in 1889 and in 1900 the Hawkeyes joined what would become the Big Ten Conference. By the early 1920s the Hawkeyes became one of the best teams in the country winning back to back Big Ten titles under Hall of Fame Coach Howard Jones. As the team’s success on the field increased, the need for a new larger football stadium was apparent. In March 1929 construction on a new football stadium began. Completed just seven months later, the Hawkeyes played their first game at Iowa Stadium on October 5, 1929 against Monmouth College. The original capacity was 53,000, very large for a stadium at this time. Originally known as Iowa Stadium, the stadium received its current name, Kinnick Stadium, in 1972 after sportswriter Gus Schrader lobbied to name it after former Heisman Trophy winner Nile Kinnick. Several expansions have occurred at Kinnick Stadium since its construction, including the addition of the grandstand in the south end zone in 1956 and the enclosure of the north end zone in 1983 increasing the capacity to 66,000. In 1997 a video/scoreboard was added to Kinnick Stadium. Today, the stadium has a capacity of just over 70,000. 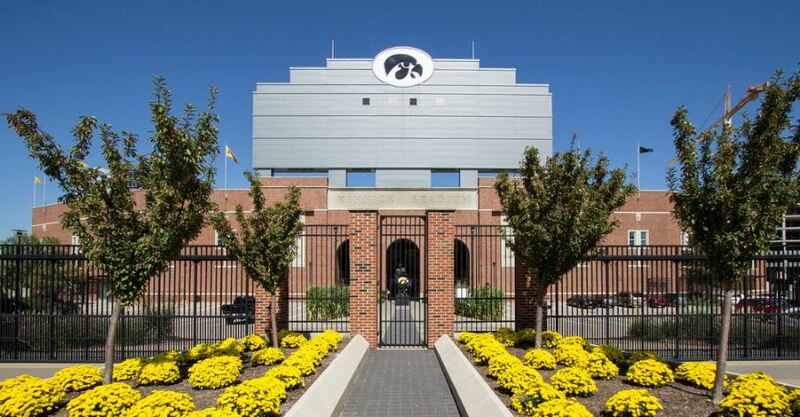 The last renovation project completed at Kinnick Stadium was in 2006. Over $86 million was spent constructing a new pressbox, installing a new video/scoreboard, replacing the temporary south endzone bleachers with permanent seating, and adding additional restrooms and concession areas. While most college football stadiums are intimidating to opposing teams because of their gameday atmosphere, Kinnick Stadium is intimidating because of one thing, its pink visitors locker room.